A master came to our class for teaching us some basics of the martial arts. I learnt that a single principle governs all the movements. Beautiful. I went to a morning session of Tai-chi class held at Kanazawa station. It is a regular class open to anyone who are interested in the Chinese martial arts. Certificated instructors have to teach a class by turns every year and that day was my turn. My class was not bad, I believe. It is amazing to see so many people, about thirty in number, come to join the class in the early morning on Sunday. I am not such a diligent learner. There was a gathering for Tai-chi practitioners for the rest of the day. It is good for anyone to take part in the event as it suits to him or her. I took part in a class on the push-hand exercise, a pairwise version of Taijiquan. I expected an intensive training, but it mainly consisted of simple exercises and explanations of principles. 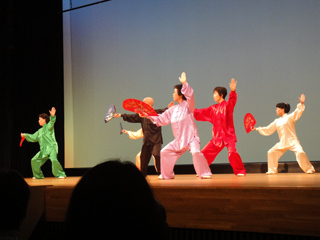 The lecturer mostly talked about Wu style Taijiquan, whose characteristics lie in developing one’s inner forces. Most interesting among many was his explanation on three stages Taijuquan. According to the theory, the practitioner begins his exercise by smoothing his movement. The stage is termed 招熟 or learning, where the attention is solely paid to the forms of movements. Having mastered those characteristic movements, he is then required to follow the flow of vital energy within. The second stage is termed 憧勁 or listening, where the attention is directed inwards. The final stage is termed 神明 or allowing, where his body and mind are interweave with each other. The lecturer encouraged us to reach the second stage. His instruction was quite practical. He showed us an illustration that depicts the way we should balance our body while walking. The method is completely different from the one we are usually taught, but sounds reasonable given his explanation. Similar explanations can be found both in Japanese (「陳式太極拳」理論) and English (Living Resiliently with Hakomi and Tai Chi). I found Wu style Taijiquan (呉式) interesting when we had finished the class.